Paddleboarding is a great fun and gives you an excellent core, legs and upper body workout. At a time when our kids are seemingly spending all their time glued to cell phones or in front of a games console we, as parents, need to take action to get them physically fit and active. When you’ve got organizations like the American Heart Association (AHA) recommending children get at least an hour a day of physical activity to ward off heart disease and diabetes it’s important to instill in them a sense of ‘keeping fit for life’. With this in mind then, what better way than to participate in a sport we adults love? Paddle boards come in a range of lengths and shapes so it’s vital that you choose something that’s most appropriate for your child. The ‘allround’ shape presents itself as more of an rounded oval which provides great stability and reduces the overall speed you can achieve – both aspects that can help boost your child’s confidence and allay your worries of them falling off. The lengths of popular adult paddle boards can stretch out from 11 to 16 feet and weigh around 28 lbs, something that a child will find difficult to carry and will also catch the merest hint of a breeze making it a struggle to walk straight. So with these thoughts in mind let’s look for the best paddle boards for kids. As with all sports we need to take steps to minimize risks of injury; paddleboarding is no different. Look for a board that comes with an ankle leash – this strap has a line that fixes to the back of the board which ensures your child doesn’t lose it if he or she falls off. Some boards come with paddles – look for one that is light, floats and is adjustable; that way your youngster won’t tire quickly and it will be able to grow with him or her. General tips for all outdoors sports apply – keep a responsible adult as a spotter to look out for any difficulties and apply sun-block as the reflected light from the water acts to increase the chance of sunburn. Wearing a life-jacket or PFD (personal flotation device) and helmet can be problematic as many kids aren’t keen but there is a good range available with eye-catching colors and designs to help you out. Start off on flat water until your child has gained in experience, coordination and strength. 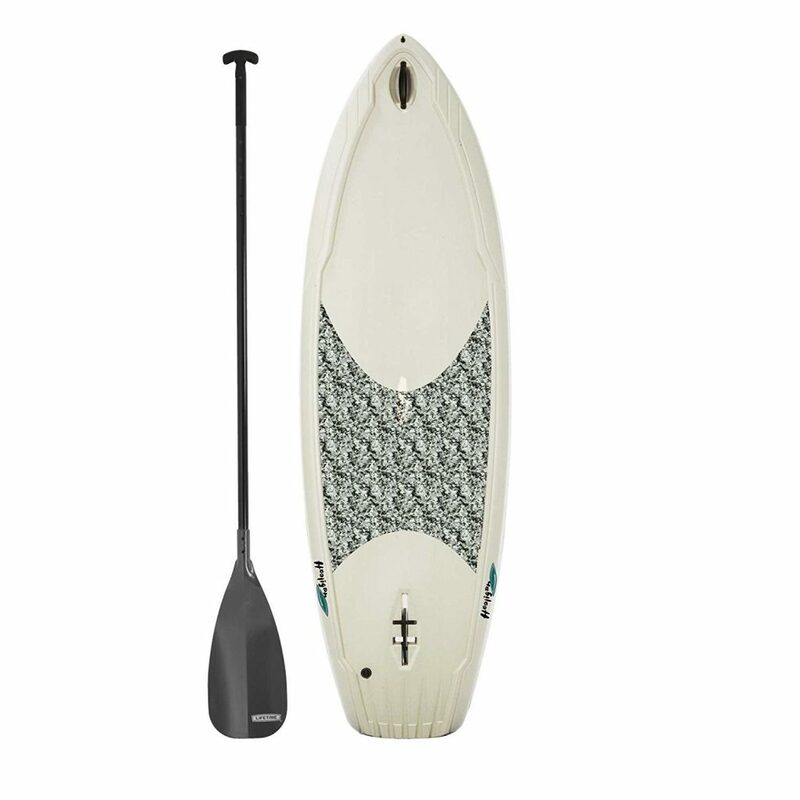 The PathFinder inflatable SUP is one of our favorites, we find it ideal as a beginner board thanks to its build quality and features. It’s made from a robust PVC with a strong multi-layer drop stitch which means that it will stand up to the rigors of paddleboarding for many years and won’t damage easily if you run it aground or collide with any rocks. It’s an inflatable board which should take an adult around five minutes to inflate with the included pump. Inflatable boards are every bit as rigid as a traditional solid board and have the advantage of being easier to transport – you simply roll the deflated board up into the supplied carry bag. The PathFinder has a healthy complement of bundled accessories, the carry bag, high pressure pump, detachable center fin, valve wrench and an adjustable aluminum paddle. The only downside is that there is no ankle leash included although there is a D-ring fitted to the board ready to have a leash attached. The board has a bungee area so you can strap down some on-board cargo. On the water our test board tracked well and was stable with a combined weight of 200 lbs, 40 lbs below the maximum with no sign of bowing. The aluminum paddle was a breeze to set to a suitable length with no drama. It feels well constructed but we’re not convinced it won’t sink if dropped overboard and not retrieved quickly. With a height of 5 inches the board sits high in the water which can be a comfort to nervous children. 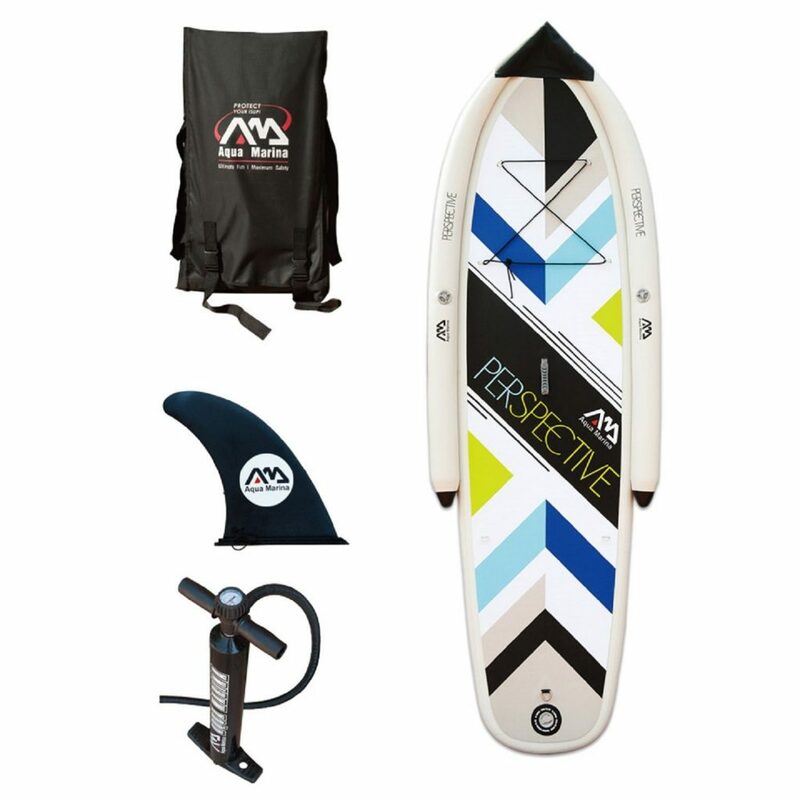 At this price point you get a great board and package for your money, inflatable SUPs do tend to command a lower price premium, just add an ankle leash and get out there! 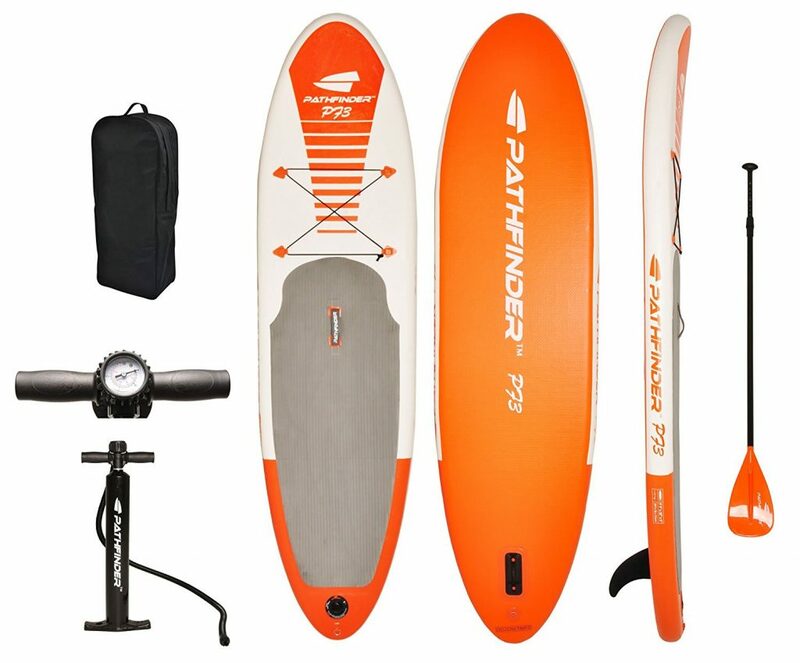 Editor’s Choice The PathFinder iSUP earns itself an Editor’s Choice because of its accomplished handling, stability and competitive price point making it an excellent board for youngsters to learn and train on. Our second entry is another inflatable stand-up paddle board. The Bimini is exceptionally durable and constructed from military-grade reinforced 1100D PVC which ensures it will take some very hard knocks without damage. When it’s fully inflated the Bimini is as rigid as a traditional board. Oh and it’s one of the most brightly colored boards we’ve ever seen! The non-skid expansive EVA track pad is ideal to build confidence but as the maximum weight load the board can support is only 130 lbs this will strictly be a single child only experience. 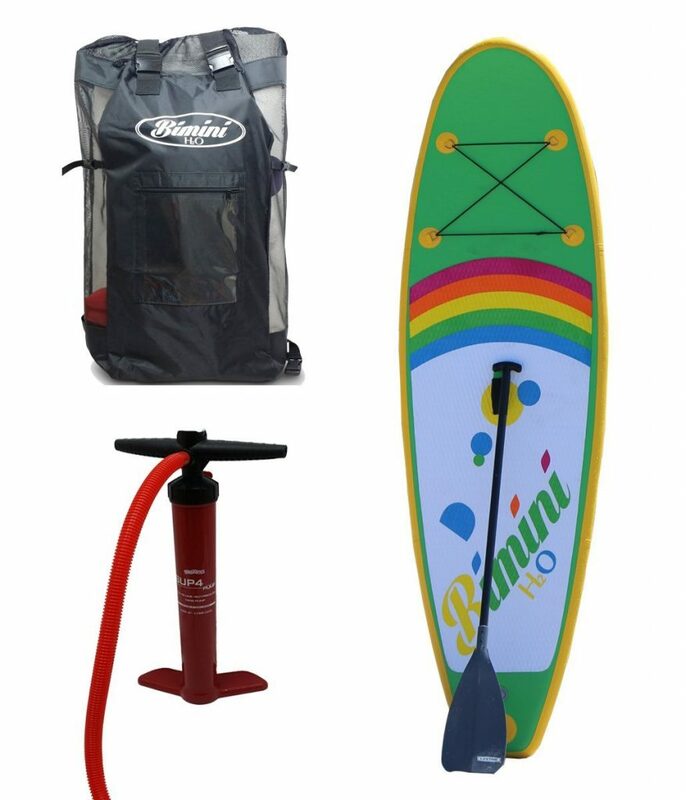 The generous package includes a backpack carry bag, dual action pump, adjustable aluminum two-piece shaft with 8.5” wide paddle, removable fin, ankle leash and repair kit. The dual action pump is great to help inflate the board within minutes as it pushes air in on the down and up stroke. The fin is of the tool-less fitting variety so you don’t need to remember to bring a screwdriver! It doesn’t end there either – if you register the product they will send you a free rash guard too. The backpack has mesh sides to allow airflow which is a must as once you deflate and roll up a wet SUP it has the chances of getting mildew. The pack is comfortable to carry thanks to large, padded shoulder straps and it’s also spacious enough to insert all the accessories. We found getting our board to the water straightforward as it’s lightweight and has two sturdy, reinforced carry handles. Once on the water the Bimini performed well, its rounded nose and tail adding to the overall stability. At four inches in height it sits lower in the water than the PathFinder so it’s more likely that water will ride across the deck. The D-ring on the tail is ready for you to attach the supplied ankle leash (these really should be a standard bundled feature so it’s good to see one in the Bimini package). The bungee area is suitable to carry a small amount of on-board items. The first thing we noticed when we unpacked this inflatable SUP was its unusual splash guards design, these side air chambers are designed to provide extra stability and reduce water riding onto the deck from the bow. We inflated the board to the recommended 15 psi in around five minutes and about the same again to inflate the sides to 5 psi. We liked the two-tone blues, green and black chevron design. It’s quite a mature look which may not suit younger riders but will likely appeal to older teens. The package includes a pump, branded backpack, detachable fin and repair kit. The deck has a comfortable brushed EVA track pad that provides good traction. Its maximum load is rated at 176 lbs which we found would support two youngsters comfortably without bending. The board has a set of D-rings located for you to fix a kayak seat to – this is a nice touch and adds to the flexibility of usage. It also has a D-ring for an ankle leash but, disappointingly, one isn’t supplied. The Lifetime Hooligan is one of the shortest boards we’ve tested and is squarely aimed at the younger kids from age five and up. This is a rigid HDPE (high density polyethylene) board and is fairly weighty at 28 lbs, several more than its inflatable rivals. Its hollow structure helps stop the weight getting too high although we found our kids couldn’t manage to carry it unaided. We would also prefer a solid board, not one that relies on being hollow for its buoyancy but this one is very robust and not likely to split. The fact that it comes with a five-year warranty gives us great peace-of-mind. Unusually for the market, its minimalist monochrome marble design isn’t very child-oriented. The track pad opts for a confetti-cut EVA design which looks and feels terrific – it offers great grip too! The board has a D-ring at the rear for an ankle leash but, sadly, there isn’t one supplied. You do get a branded, gray and adjustable (64” to 72”) paddle though. The fin cleverly folds away for easy storage. 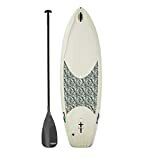 This SUP amazed us in the water, its stability is very impressive and we could stand one of our reviewers on it with a child and it remained well balanced. This is not always the case on boards produced for children. At the higher end of the market, the BIC stands out for its ‘Dura-Tec’ construction which makes these among the most durable boards you can find. The outer shell is HDPE and its core is high-density foam – rigidity, performance and buoyancy. The track pad is a diamond-patterned EVA which offers excellent grip. All this comes at a weight cost, the BIC Sport is a hefty 30 lbs making it the heaviest board here and one which the parents will have to carry. 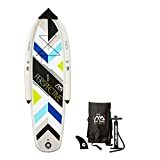 BIC Sport Tough-TEC Performer Sup Stand Up Paddleboard, White/Red/Maroon, 11'6"
The board has two inserts for a bungee carrying area and a 10” US Fin Box to allow for easy fitting of third party fins although a high quality polycarbonate fin is included. Surprisingly the BIC doesn’t come supplied with a paddle or ankle leash. So you will need to buy these separately – we like to think that their omission is due to BIC devoting the purchase price into the board quality itself! The clean and bright colors of the SUP are attractive, professional looking and one that our reviewers of all ages found appealing. Our reviewers loved the chance to get the BIC out on the water. We had a blast; the hard board was very responsive and one which we can totally recommend. Your youngster will experience great tracking and maneuverability with less effort needed than on an inflatable SUP. Editor’s Choice Showing that BIC doesn’t just make great pens! The BIC Sport SUP earns itself an Editor’s Choice because of its stability, performance in the water and great build quality that allows it to be used by kids and adults alike!